A weed is a plant, or thought, habit, person...growing where it is not wanted. Some weeds may be easily plucked out and never seen again; others sprout even more weeds where there had been only one. What to do? As a Master Gardener, I was taught to identify the weed, and then determine the best strategy to eradicate it. Why is this important? Weeds can be competitive – as in more successful, sometimes to the detriment of everything else in their wake. Weeds can be pernicious – as in having a harmful effect to the health and environment it resides. Weeds can be persistent – as in continuing to exist or endure; otherwise known as tenacious. 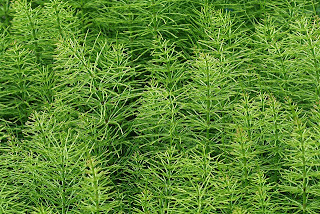 Consider Equisetum, or Horsetail as it is called. It is a true living fossil, and can adapt to even the worst growing conditions. It does not respond to threats by herbaceous weed killers or rooting out because their roots extend to China! Actually, roots or rhizomatous stems can be up to 6 feet long and send out horizontal runners sending out new shoots and even more runners. Try yanking on that! Weeds mean different things to different people. What I may consider a weed, someone else may cultivate and care for. So, I say again, what to do? The best thing I have found in dealing with weeds in my garden, and in my life, is to remove them as soon as possible. Because sooner or later - what was a weed will still be a weed - only bigger. And since they are competitive, pernicious, persistent, and can only become more difficult to eradicate the longer I wait to get rid of the thing, I have adopted the practice of mindful plucking when I first identify a weed. The more mindful I am about identifying weeds, the better I become at getting rid of them. And when all else fails, I find satisfaction in getting my blowtorch out and taking aim. Flame on!